What is the structure in common to all games? Do they all ask and answer a question? What is the role of the conscious and the unconscious in serving each other? 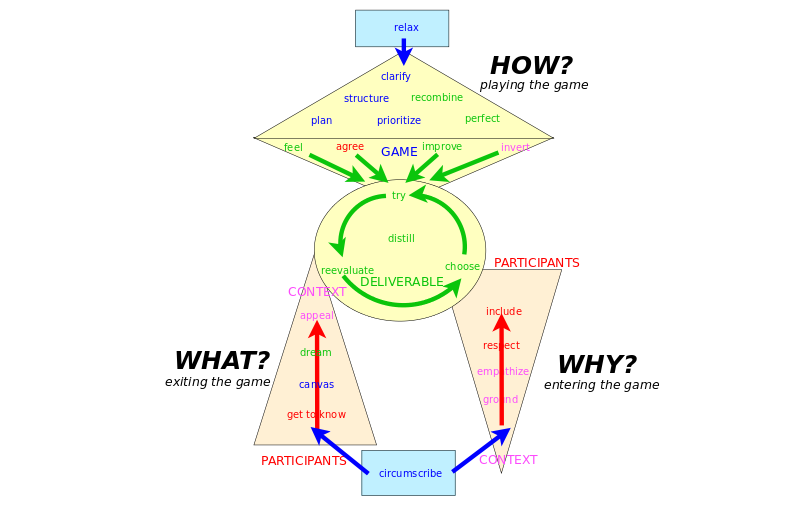 What is the role of joint intentionality - in each game and all together - and what maintains it? My own deepest value in life is living by truth..
My own questions are How do people behave? and How should they behave? Why innovation games are interesting: and this is important for managing innovation: What make us human is not our cleverness but rather our joint intentionality. Synchronized movement - compare groups of apes - autistic people - regular people. Evolution - singing, drumming, dancing, and more broadly, playing games - drove the evolution of vocal chords, human hands and upright posture. Balancing the unconscious mind (System 1 - what we know - our answer - our deepest value) and the conscious mind (what we don't know - our question). Gamestorming, "like brainstorming but with games". There's no direct process for creativity. was a book, a Collection of the Best Practices for workplace collaboration - games used in Silicon Valley since the 1970s - Xerox Park - like brothers Grimm did with fairy tales. Keep it simple, easy, rugged and fun to use for people at work. Only stuff you could do with the stuff in your supply cabinet - and designed for total chaos - be able to improvise quickly. Boundaries in time and space. Goal - objective - shared or in competition. Journey - go from A to B.
Divergent - step into the game, emergent - open up that world, convergent - climb back out of game. Opening: Set the stage, develop themes, stay loose, get a sense of where people want to go. Be dumb - get in touch with your ignorance. Sense what they want to do, to contribute. Light a fire - ask a question, fill in the blank. Explore - get physical - up and moving, try out options, experiment. Manage the altitude and speed. Conclusion - decision and action - the next step - focus on the artifacts, the deliverables. Which of the three languages does it relate to: argumentation, verbalization, narration, or all three?